This document is prepared by DOD IT Solutions, to give you an idea of how our MAKE MY TRIP HOTEL CLONE SCRIPT features would be. Our Hotel Clone Script is completely in built and has automated modules which are specific for online travel business. Online web based benefits of hotel room reservation process, create more sale leads and track customers, and most of all, it helps in maintaining your repeated customers info. You can analyze reservation trend details and work towards your future needs. 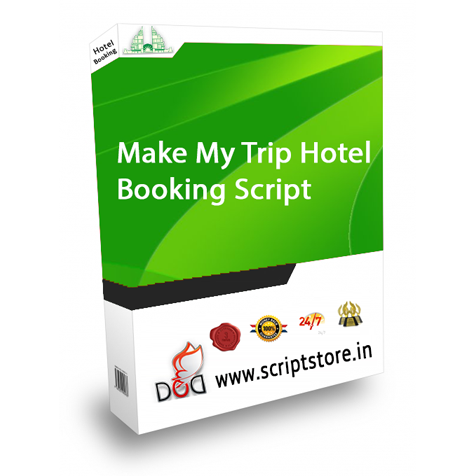 Make My Trip Hotel Clone Script is the easiest, Fastest and secure Php Based script for Hotel booking Websites. Download this Clone Php Script and start your own Hotel booking website. User can search by entering location, check-in and check-out date along with the number of rooms and as well the number of adults/children whose going to reside. Map search is also available. Check by filtering the pay scale ranging from the least amount to the highest. Can check by selecting a particular location. User can view the complete address of the selected hotel. Can view images and hotel amenities. Choose the particular room that you wish (Singe/Double/Luxury/Deluxe...etc). Access to API Hotels and Offer Hotels. Manage bookings and tickets list. Maintain payment gateway and user wallet. Banners to pop-up with offers would be generated. Texts as flash notes either at the top or bottom of the page could be generated. Agent can add the hotel details. He can view and block the room that’s not of interest. Can print or cancel ticket. User can login using Gmail or Facebook. Basic account and contact information. Once registered, a notification to be sent to the provided email. Payment could be processed through preferred payment gateway. Booking details would be generated through SMS. Registered users would be capable of accessing wallet, where the day’s offer price would be transferred automatically to the wallet, at the time of booking. Guest users can as well avail the offer, but the difference is that as they don’t have access to a wallet, the offer price would be directly deducted from the booked price. User can print/cancel his booking, and the refund would be processed either to the wallet or to his payment gateway account.